MATLAB® in bioscience and biotechnology presents an introductory Matlab course oriented towards various collaborative areas of biotechnology and bioscience. It concentrates on Matlab fundamentals and gives examples of its application to a wide range of current bioengineering problems in computational biology, molecular biology, bio-kinetics, biomedicine, bioinformatics, and biotechnology. In the last decade Matlab has been presented to students as the first computer program they learn. Consequently, many non-programmer students, engineers and scientists have come to regard it as user-friendly and highly convenient in solving their specific problems. Numerous books are available on programming in Matlab for engineers in general, irrespective of their specialization, or for those specializing in some specific area, but none have been designed especially for such a wide, interdisciplinary, and topical area as bioengineering. 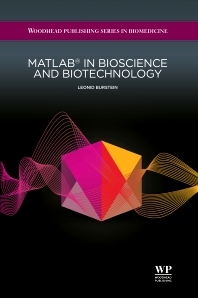 Thus, in this book, Matlab is presented with examples and applications to various school-level and advanced bioengineering problems - from growing populations of microorganisms and population dynamics, reaction kinetics and reagent concentrations, predator-prey models, mass-transfer and flow problems, to sequence analysis and sequence statistics. Dr Leonid Burstein is a staff member of Kinneret Academic College (Quality Assurance Department), before that he taught at the Technion -IIT, at ORT Braude College, and at several other academic institution in Western and Lower Galilee, in Israel. His scientific work has been reported in more than 50 publications in leading scientific journals. He is author and contributor of published textbooks, monographs, and an Editorial Board member and reviewer for several international scientific journals.